Next year I hope to join the Indie 500 crowd in DC. Since that wasn’t possible this time, I’m filling in for Amy on the Sunday NYT. I rolled my eyes at the title of this one since I really don’t like word search puzzles. Luckily, this wasn’t literal. Each theme answer tells us where we can find the words in the clue. I like this theme – it’s clever and consistent and not something I remember seeing recently, if ever. All the phrases are in the language and it was fun to solve. 20a [Ones with good poker faces?] = RHINOS. Took me a minute to figure out how that fit. 47a and 55d are both [“Aww”-inspiring] = ADORABLE and CUTESY. 49d [Certain racy magazines] = MAXIMS. This is strained and unnecessary. As clued, it’s a roll-your-own plural that sounds absurd. A MAXIM is also a proverb or adage and that’s a plural I can imagine someone actually using in a sentence; still a bit clangy but not ridiculous. Is it really that important to have a wink-wink-nudge-nudge moment about “racy” magazines? I won’t say any more about the magazine in case my brother reads this (he was editor-in-chief of Maxim for a few years.) It’s a bad entry, no matter what you think of lad mags. 100a [Flames that have gone out?] = EXES. Nice. Well, break-ups aren’t nice. The clue is nice. What I didn’t know before I did this puzzle: that a POSTERN is a back entrance. Yesterday was the second annual Indie 500 crossword tournament, and I am wiped out! I’m so glad I got to see as many people as I did yesterday, and my sincere apologies that I didn’t get a chance to have a proper conversation with so many people who were there. Thanks a ton to everyone for coming; thanks to the volunteers and test-solvers who were critical to the tournament running smoothly; thanks to the co-constructors for having great ideas and putting in a lot of hours on the puzzles; and thanks especially to Erik, Peter, and Angela for working ridiculously hard to put the tournament together. 22a, SMOG AND MIRRORS [Without 3-Down, artful deception]. 3d is FOG [Driving hazard]; SMOG without FOG is SMOKE, which leads back to the base phrase SMOKE AND MIRRORS. is RED [___ alert], and ORANGE without RED is YELLOW, giving us YELLOW JACKETS. 52a, MULE OF A DIFFERENT COLOR [Without 30-Down, separate matter altogether]. 30d is DONKEY [Critter orchestrally imitated in Grofé’s “Grand Canyon Suite”], and to get a MULE, you have to cross a DONKEY with a HORSE — thus, HORSE OF A DIFFERENT COLOR. 73a, COME TO A SPORK IN THE ROAD [Without 76-Down, arrive where one must decide between options]. 76d is SPOON [Aid in a stirring experience] (good clue); a SPORK is a hybrid SPOON/FORK; thus, the base phrase COME TO A FORK IN THE ROAD. 90a, SKORT THE ISSUE [Without 90-Down, be evasive]. 90d is SHORTS [Golfer’s garb]; a SKORT is a hybrid of SHORTS and a SKIRT, so the base phrase is SKIRT THE ISSUE. 110a, CHARLOTTE’S BLOG [Without 100-Down, classic children’s novel]. 100d is LOG [Shipboard account]; a BLOG is a WEB LOG, so the base phrase is CHARLOTTE’S WEB. This one doesn’t work quite as well as the others for me; I don’t think I’d call a BLOG a hybrid between a WEB and a LOG, where as the other five mostly work that way. Still, I find the idea of a modern children’s book called Charlotte’s Blog in which a spider takes to the Internet to try to save a pig simultaneously wacky and endearing. I’m inclined to give it a bit of a pass; “hybrid” in the title of the puzzle could, I guess, refer to actual hybrids and/or to portmanteaux in the style of SKORT, SMOG, and SPORK. 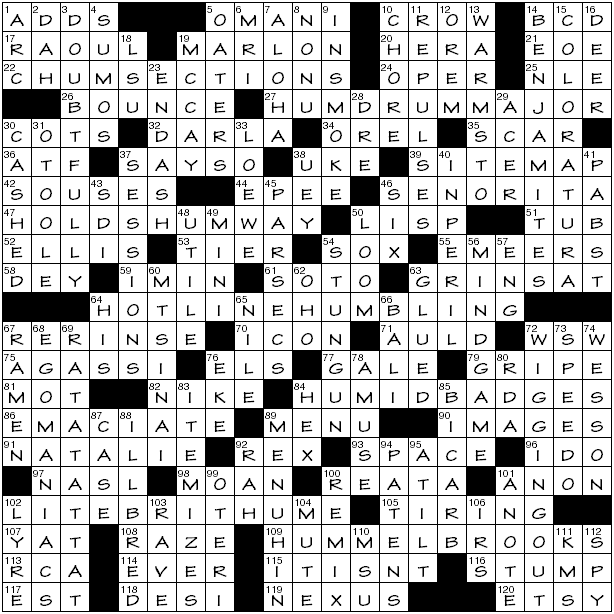 Six theme answers would generally be on the low end for a 21×21; however, (a) two of these span the entire grid, so we get almost as many theme squares as we normally would; (b) getting the six down entries to cross one letter of the appropriate word in the across entries is really challenging. The theme is absolutely the star of this puzzle; there’s a few standouts in the surrounding fill, like ARCHETYPE, ROMCOM, MARS BAR, BACKLESS, and IT’S LATE. I hadn’t seen OTC DRUG in a puzzle before; not sure I love it, but it’s definitely inferable. There’s also the standard ALAE and ENDE and ACR and INSTR that make a puzzle like this possible, but I didn’t really mind. This puzzle taught me that there’s a PETR I should know about besides [Tennis player Korda]; there’s also [Czech hockey player Nedved]. I have absolutely no idea how I knew about SHMOO, but I confidently plopped it in at 1d [Stubby-legged Capp critter] to start the puzzle. 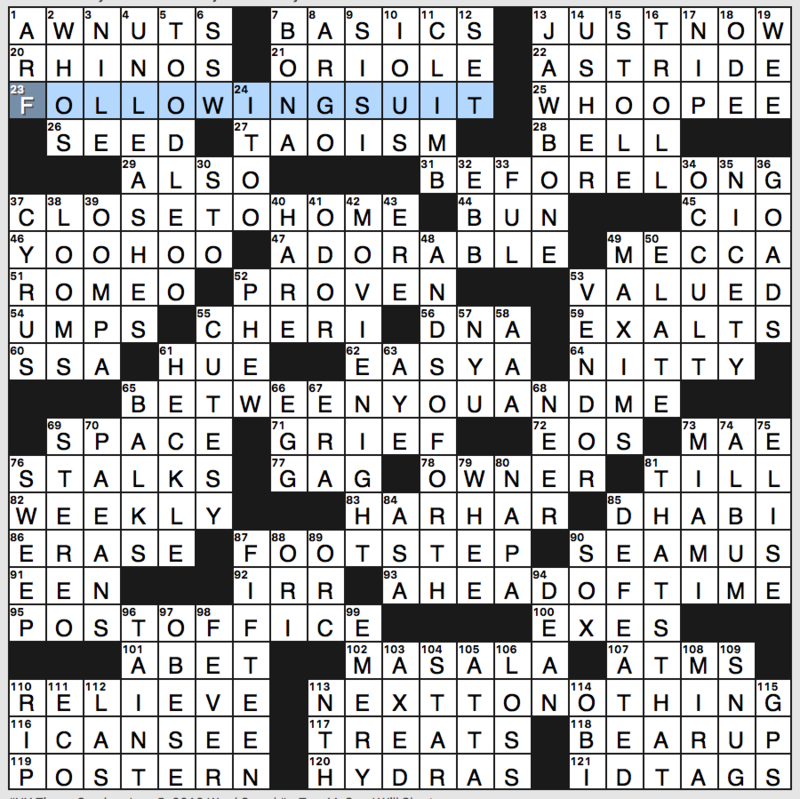 I must have learned the name from crosswords, but I don’t remember seeing it recently. Okay, I’m off to enjoy the splendors of DC! Until next time! Yet another meta. I think the universe is trying to tell me something. Evan was kind enough to give me a heads-up to look at the notepad and then pannonica and I team-solved the meta, by which I mean that pannonica solved it and I helped. A little. The puzzle itself is straightforward. 23a [*Daily since 1851] = NEW YORK TIMES. 25a [*Hollwood-based alternative newspaper] = LA WEEKLY. 41a [*Southwest menagerie with an Arizona Trail] = PHOENIX ZOO. 51a [*Annual race often run in October] = CHICAGO MARATHON. 70a [*With “The”, 1965 film about high-stakes poker] = CINCINNATI KID. 87a [*Waterway that runs near the Alamo] = SAN ANTONIO RIVER. 96a [*First-ever professional bridge team] = DALLAS ACES. Say what? Professional bridge? Team? 114a [*Former TLC reality show about Florida-based tattoo artists] = MIAMI INK. 116a [*2014 Lana Del Rey song about hipster life in a Big Apple borough] = BROOKLYN BABY. Put it all together and you get ATHLETICS as in the Oakland Athletics and also, generally, sports. No real anagram – you take the missing letters from the teams going down the grid in order. I asked Evan if there was an additional meta or theme about teams that have moved (the As used to be in Philly, the Rams have moved three times, etc) and he said no. So that’s the story. I probably could have figured it out on my own but it’s getting to be afternoon and Emma is impatiently waiting to go shopping for party supplies. What I didn’t know before I did this puzzle: professional bridge? Teams? Cue Steve Manion. Was actually flummoxed a bit by this one. It was evident that the theme ADDS (1a) H-U-M to existing phrases, but between 27a HUMDRUM… and 64a HOTLINEHUM… I was absently led into thinking it had something to do with boredom. Even misinterpreted the title as referring to “droning on” rather than a mere drone. Just what it says on the box, eh? 22a. [Friend zones?] CHUM SECTIONS (C-sections). 27a. [Boring college concentration?] HUMDRUM MAJOR (drum major). 47a. [Hug ALF?] HOLD SHUMWAY (hold sway). I would never in a million years known that ALF (alien life form) from that silly ’80s puppet-based sitcom had another name, and that that name was Gordon Shumway. Never watched the show, even though I was more or less the right age for it. I have standards! 64a. [Causing deflation on a crisis phone call?] HOTLINE HUMBLING (“Hotline Bling”). A song by Drake, apparently. 84a. [Sweaty employee cards?] HUMID BADGES (ID badges). I don’t want those stinkin’ badges. 102a. [Superficial Fox anchor?] LITE BRIT HUME (Lite-Brite™). 109a. [Creeks with figurines?] HUMMEL BROOKS (Mel Brooks). A capable theme, but not a particularly … >yawn< … exciting one. See? Perhaps my first impression is coloring my judgment. Favorite clue: 38a [Twee instrument] UKE. Runner-up: 63d [Stuck up?] GLUED. 14a [A Train?] BCD. Is the capitalized T overly transgressive, even with the question mark? 3d [Full of questions] DOUBTFULLY. Egregious dupe. In light of this, I’m moderately less upset by 93a [“Gravity” setting] SPACE and 45d [Space distances] PARSECS. 23d [Minus symbol] EN DASH. Well, 115a [“No. Way.”] IT ISN’T. And, 30d [Endorsed] CASHED. No, not the same, not quite. Check it out for yourself. 76a [Add to, with “out”] EKE. Tricky, but defensible. Stacks! BENJAMINITES / COLORATURA, EGOMANIACS / RAT-A-TAT-TAT. Benjaminite sounds like something nasty to put on toast. Really liked RAT-A-TAT-TAT, but is that the sound of an Uzi, per the clue? Here’s a bunch of fill I didn’t love: EOE, NLE, OREL, OREM, NASL, REATA, NON-U, LSU/MSU dual presence. Don’t feel too strongly about this, but seem compelled to mention because they’re one-after-the-other: 55a [Islamic chieftains] EMEERS (var. spelling), 58a [Old Turkish title] DEY. Enjoyed seeing DESI clued as [From India], thought it also refers to peoples from the other nations on the subcontinent. No offense to Mr Arnaz, but a change is nice. Okay, now I’m just desultorily casting about for padding—time to wrap up the write-up. I’ll give this one a solid meh. This entry was posted in Daily Puzzles and tagged Brendan Emmett Quigley, Evan Birnholz, Paul Coulter, Tom McCoy. Bookmark the permalink. I really enjoyed this puzzle. The theme was easy but still required a little thought, and it was very well executed. 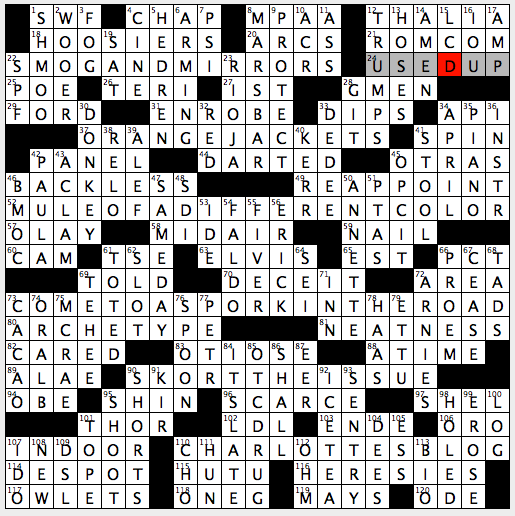 Sure, I choked a bit on the clue for MAXIMS, and maybe I didn’t need quite so many exclamations (TOODLEOO crossing YOOHOO would have been plenty for me) and partials (OOMPA, NITTY, DHABI, …), but all in all, it was a very pleasant solving experience. Favorite clue was “Offensive poster” for TROLL. What I didn’t know before I did this (very good) puzzle: the unnamed female from the novella “Of Mice and Men” is called MAE in the movie. Thanks for the info. Like you, I’d not known Curly’s wife had been named in the film version. Personally, I’d rather see her remain unnamed because her namelessness poses interesting questions when discussing the novel with students. Yes, to be clear, not criticizing, just new knowledge for me. Also, the idea of Hal Roach or Betty Field’s agent pounding s desk & saying “You mean she doesn’t have a name? Every character needs a name!” is fairly amusing. 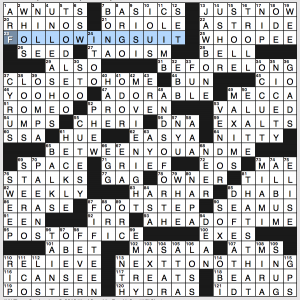 I am not a stickler for perfection, political correctness, or purity when it comes to crossword puzzle clues because I prefer to give the constructor some latitude, given the complexity of the task of creating a puzzle. 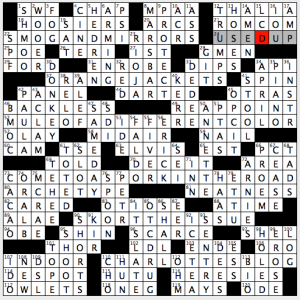 But I was “puzzled” by today’s NYT’s 73 Across: “Flirtatious wife in ‘Of Mice and Men. '” I’ve read and taught the [published] novella often; this character is known only as “Curly’s wife.” In fact, I’ve had interesting discussions with my students about Steinbeck’s reasons for not giving a name to the only female character in the book and have used this to introduce my students to the basic principles of gender criticism. I’ve not seen a stage or film version of “Of Mice and Men”; is the character given a name in either of these? 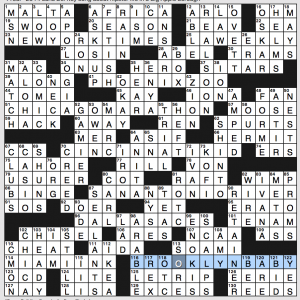 NYT: It’s what a Sunday puzzle should do. I really enjoyed the puzzle. Your dings were my favorite theme entries. They were more different from the actual phrase than the portmanteaus and that made them a little more challenging. Thanks, PJ. I originally tried to pep up the theme entries by changing the base phrase’s meaning in the clueing, i.e. “Where the eldest Brontë sister might find an audience today?” for CHARLOTTESBLOG and “Find a bit of fast food litter on the highway?” for COMETOASPORKINTHEROAD, but Rich convinced me there was already enough trickery, and the easier clueing approach we followed would appeal more to the average solver. Sorry, but I can’t agree that the cute theme justified the awful fill. Take a look at just the downs; count the trivia proper names, abbreviations, partials . . . Swell puzzle! I loved it. 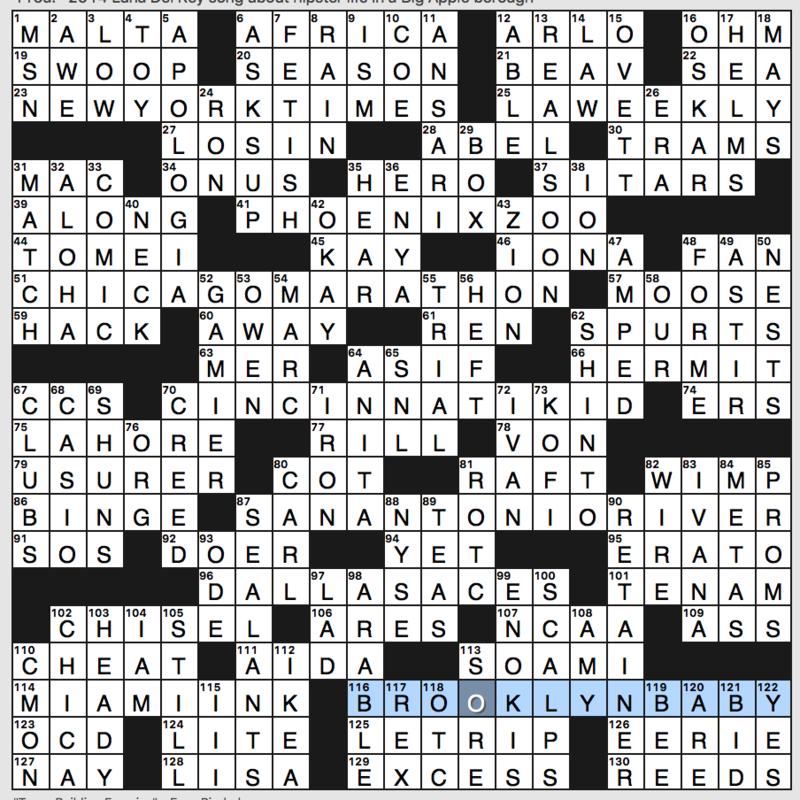 Best LAT crossword in quite a while! 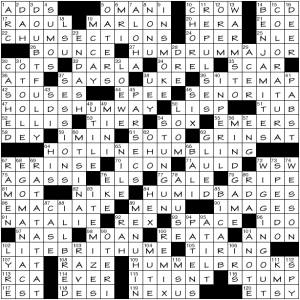 What is the metapuzzle solution to today’s Sunday WP crossword “Team-Building Exercise”? I’m stumped. First I looked for a ten team league with these cities as members. Quick dead end. All of the cities have an NBA franchise except Cincinnati, which used to have the Royals who became the Kings. I looked at building as a verb and got nowhere. I tried it as a noun by looking at arenas/stadia in the cities but got nothing. Maybe I’m a little off this weekend. MGWCC took me a lot longer than it should’ve. Very nice. I took note that META was in the grid but quickly went past it. I’m also pretty Yankee-centric when it comes to NY baseball. My version of the WaPo team solve differs slightly from Jenni’s. We independently noticed SPURTS/SPURS (she kept quiet about TRAMS/RAMS), and then collaboratively found the rest (I pounced on more, it’s true). But while I was assuming there’d be another entry somewhere in the grid composed of a team epithet + 1 not associated with a theme answer, Jenni suggested that the extra letters on hand would constitute the meta answer. I countered with the notion that they’d be in theme-entry order. And so it was. Definitely a team effort. Thanks. I’m sure I did something bass-ackward with the HTML. pannonica, you hit the exact same stumbling blocks that I did, regarding BEQ’s puzzle. I think it’s the first, truly BEQ-branded puzzle (esoteric, subculture references and strained cluing) since he’s been working with HEX. While it could have had more (alternative?) pop culture references, it had more than enough for my tastes. My disdain for puns, especially ho-hum ones like in this puzzle’s theme, added no joy to my solving experience. Hopefully, we’ll see a return to the kind of previous stuff Brendon has been providing, since hooking up with HEX. I think they’re more befitting the ersatz Boston Globe audience. Thanks for the link to the minus sign info. I, too, was suspicious about that but I let it go without further investigating my hunch. WaPo: Ugh. Why does 84D “A” come before 30A “T” and so forth? And why the pathetic Athletics (please go away: you’ve already been in Philadelphia and Kansas City) as opposed to the GIANTS or the WARRIORS? Sorry. I almost always love Evan’s puzzles. This one? Not. I realize my objections are probably idiosyncratic, so I won’t give it a rating. ATHLETICS = 9 theme answers, which is surely objectively better than 6 or even 8. I chose ATHLETICS as the meta answer because, in addition to being an actual team, that word has a pretty strong association with professional sports. And like pannonica said: you take the team-plus-one-letter entries in thematic order. New York is the first one, then LA, then Phoenix, etc. It’s not random. I posted about this last week, but I seem to be the only person in the universe having trouble. I can’t load Evan’s WAPO puzzle. I’m on iPad 2 and I get a message that “Sorry, game was not found for your device.” If I click “Play other games,” I’m taken to their wonky interface with a puzzle that is not by Evan. Help! I was busy all day and just got around to reading the blog. The Dallas Aces were a professional bridge team started in the late ’60s or earliest ’70s by a wealthy man named Ira Corn. There was a syndicated column featuring their games. The purpose of the team was to compete against the great Italian Blue Team, which had dominated world class duplicate bridge for years. The only person I remember from the team was Billy Eisenberg, who was a great backgammon player as well as a superb bridge player. When Corn died, the team gradually disbanded. As to RHINO, the reference is not to a poker player, but to the Rhino’s horn, which could presumably be used for poking. As to how there could be a professional bridge team, in the big national bridge team game events like the Bermuda Bowl or Spingold, the events are run as round robins or double elimination events in which two teams square off with one pair from each team playing N and S and their partners playing E and W on the same set of hands. The scoring is with IMPs (International Match Points).